Unbelievably sweet and fresh, the color of fresh peas, and delicate. Using water instead of stock makes this pure and light, but the complicated garnish gives it bite, texture, and interest. Some say it's named after the 18th century raconteur Comte de Saint-Germain, the so-called "immortal German alchemist," who exercised great influence over and went on secret missions for Louis XV before being driven to England by hostile French nobles. It's possible, of course--this was a time when chefs named dishes after extraordinary public figures. But no proof that I could find. Also, don't be misled by Saint-Germain recipes that call for split peas: they're good soups, but they're not Saint-Germain. Serve hot to 6 people as a first course. 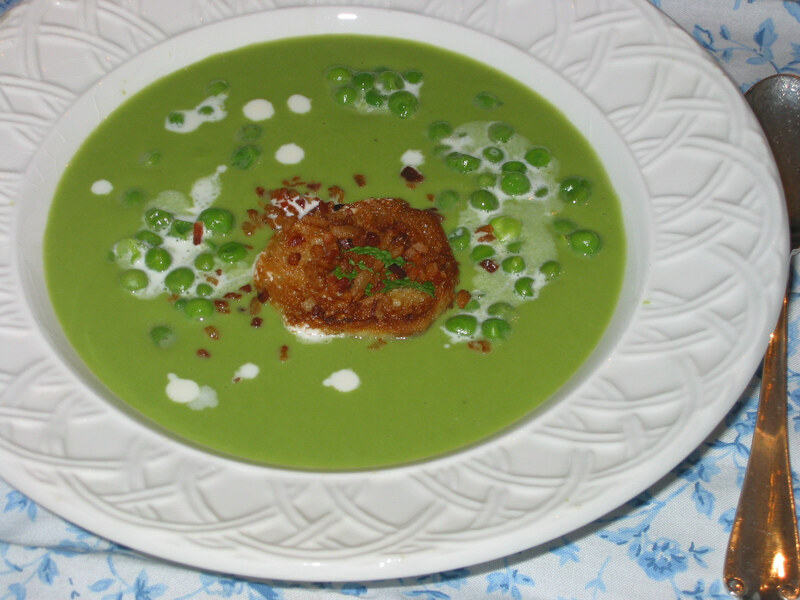 Garnish: big drips of heavy cream, 1/2 cup reserved peas, 6 thin crouton rounds (fried in the bacon fat), tiny bacon bits, and 6 small fresh mint or chervil leaves. Cut the bacon into a tiny dice and fry in a frying pan until crisp, then drain on paper towels. Fry the 6 thin rounds of French bread (no crusts) in the bacon grease til crisp, then reserve on paper towels. In a large saucepan, heat the butter over medium and stir in the frozen peas. Cook, stirring, for 5 minutes, until the peas are thawed and plumped. Pour in the water, salt, and bring to a boil on high heat. Reduce heat to a simmer, snug in the bouquet garni, partially cover, and simmer for 15 minutes. Discard the bouquet garni and reserve 1/2 cup of the peas for the garnish, mixing them with a little butter for flavoring. Purée the peas, solids first, in a blender. Work the purée through a strainer (you want to get rid of all the pea skins so the texture is very smooth and delicate). Reheat the soup on low heat, adding water, if necessary, to get a nice soup consistency. Season to taste with more salt. Enrich the soup by whisking in the remaining 3 Tablespoons of butter, in small pieces. When ready to serve, ladle the soup into 6 flat soup plates, sprinkle each with a heaping Tablespoon of the reserved peas, then spatter a Tablespoon of heavy cream into each serving. Top with the reserved crouton, sprinkle each with a crouton, and top each with a small leaf of mint or chervil.